This is one riddle that may just confound you. Eamon Bryne has died. At the beginning of The Celtic Riddle, the heirs have gathered to listen to the will. None are to happy too learn that part of their possible inheritance is a treasure hunt. Eamon has instructed his lawyers to give each of his heirs a single clue. Each clue will lead to another clue about the treasure or its location. His hope was that his fractured family will work together to solve the riddle and claim a truly valuable prize—a much better inheritance than what most of the heirs received from Eamon’s crumbling estate. In attendance—though not an heir herself—is antique dealer Lara McClintoch. She has accompanied heir Alex Stewart, who once saved Eamon’s life. However, the family seem to resent both his and Lara’s presence. Lara serves as narrator, and in the first chapter, she paints a rather detailed portrait of the family and servants. There’s Eamon’s wife, Margaret; his daughters Eithne, Fionaula, and Breeta; Eithne’s husband Sean McHugh; Fionuala’s husband Conail O’Connor; servants Michael Davis, Deirdre and John Herlihy; and the seemingly interchangeable lawyers Ryan McGlynn and Charles McCafferty. Oddly, of the servants only Michael receives a clue. He’s also described as the only apparent likeable character Lara and Alex have met. The will reading ends with Alex revealing his clue to everyone, and the family abruptly leaving. Later, Margaret will claim the family has no interest in pursuing Eamon’s ridiculous quest. Only Conail appears to break ranks and actively conduct a search on his own, and he seems to have no qualms about using underhanded means to thwart others along the way. Before the hunt truly gets underway, Michael takes Alex and Lara to Rose Cottage, which Alex received as his inheritance. There, they discover Eamon’s youngest daughter, Breeta, reminiscing about better times. Michael shares his clue, and Breeta–though she didn’t claim her clue since she left the will reading early–realizes that the clues are the first lines of an Irish poem, the “Song of Amairgen.” Shortly, after Lara happens upon one of the hidden clues and the dead body of John Herlihy. John—known to enjoy his drink—may have taken a tumble over the nearby cliff, but Lara suspects something more. When another victim is found dead and clutching a torn clue, Lara vows to find the treasure and unmask a killer. The premise of this mystery—a treasure hunt leading to murder—is an appealing one. The execution of the tale is somewhat uneven. The prologue begins an ongoing tale of Irish legend that is interspersed throughout the novel. An initially unknown narrator recounts the legends of the Tuatha de Danaan and legendary god-like heroes: Lugh, Diancecht, Nuada, and Dagda. Without knowing quite how this legend ties into the story, some readers might find it breaks the narrative. Lara, as narrator, is an engaging character. Early on, though, her narration includes a fair bit of exposition that makes it more difficult to get into the meat of the story; her lenghtly description of the family in Chapter One is a prime example. She paints an excellent portrait of these characters, but it comes too early and all at once and many of the characters don’t appear again until much later in the story. Perhaps the most confusing thing for readers may be the clues themselves. Not the ones related to the murders. Those are few and far between. Eamon’s treasure hunt clues are numerous and difficult to follow for readers not familiar with Irish lore. It appears they were well thought out and researched by the author, but the discovery of some clues don’t receive the attention one would expect. As an example, Lara and company find one clue but then claim it’s “too windy” to read it just then, and it’s pages before we come back to it. I chose this book as part of the archaeologically-themed discussion series, “Unearthing Murder.” The book doesn’t really involve archaeology—or anthropology for that matter—except for the treasure hunt, involving an artifact that may be related to the Irish legends we’re given a glimpse of. I truly liked the concept of The Celtic Riddle and found myself enjoying it, for the most part. Perhaps its imperfect execution is what makes it endearing. I find myself wondering if third-person narration would have been a better choice. First-person can be so limiting, and some characters’ personalities seemed to shift too abruptly as a result. 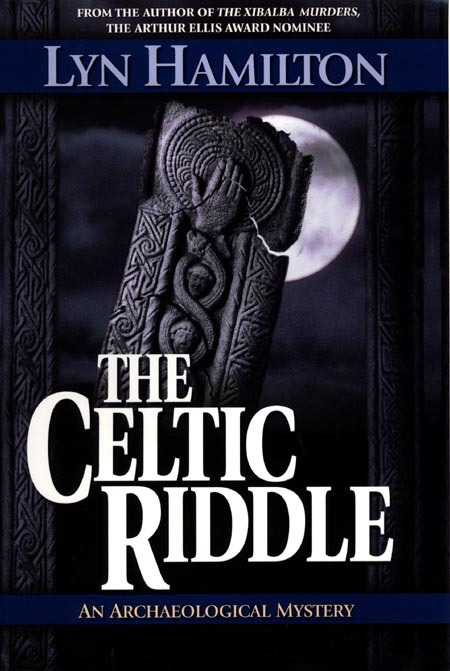 Published in 2000, The Celtic Riddle is Lyn Hamilton’s fourth novel in the Archaelogical Mystery series, starring globe-trotting Toronto antique dealer Lara McClintoch. Interestingly, three years later, the story was adapted for a television movie of Murder, She Wrote with Jessica Flectcher substituting for Lara. A few other characters, including Alex Stewart, were excised for the 88-minute feature. As an avid Murder, She Wrote fan, I’m sure I saw that version of The Celtic Riddle, but hadn’t realized it was based on a book. Now, having read the source material, I’m curious to rewatch the episode, which recently became available as part of a 4-movie collection on DVD.